When my hubby and I were dating and I was doing the intense “get to know you questioning” phase – I asked him a zillion questions about his vacations, his friends, his hobbies, his pets etc… and also his schooling. I discovered that he had done a Masters at UC Berkeley – which was tremendously impressive to me – Berkeley was one of a handful of schools I had actually heard of in South Africa. As I quizzed him about Berkeley, I learned something interesting. I learned that you can finish up a Masters in Engineering at Berkeley in one of two ways. You have to take an exam to finish up – but you can either take a Masters exit exam, or you can do a PhD entrance exam, which not only finishes your masters but also gains you admission if you want to do a PhD later on. You, friend, if you believe in Christ, have been “justified” by God – declared to be in the right with him. But I think that many of us have a view of justification that it is like an “exit” exam. It gets us out of the guilty seat in court, scot free. We have the idea that justification means we have a spiritual “white board” with all our sins written on it, and then in court Jesus wipes away all those sins and gives us a “get out of jail free” card. We think justification means that Jesus gave us a ticket out of the sin-exit exam. But if you look at the way the Bible talks about justification – that’s not quite right. Justification is not just an exit exam. It’s not just picking up a get out of jail free card. If you’ll forgive the monopoly on these terms – it’s more like picking up a get out of jail free AND a “community card”. Because justification is more like a PhD ENTRANCE ticket- it gets you OUT of one program, and simultaneously admits you to another. Justification in Christ means that we are included in the blessed, forgiven people of God. Jesus gave us a ticket out of sin and into his community. And of course your sins needed to be forgiven to get there…. but that was just a part of it. If we are in Christ, justification means we are part of God’s covenant community. There is no “us and them“. We were saved together, we worship together, we mess up and forgive each other… together. Friend… or should I say sibling, if you think you can do Christianity alone, you should go ahead and call it something else; because it is not Biblical Jesus following. He died and rose again for US. Not me on my own. for US – his PEOPLE. We are PLURAL. No going solo. I know the church is full of frustrating, broken, hypocritical people. Jesus didn’t come to save great people or reliable people. He saved wretches, and so you are quite right when you observe that the church IS full of wretches. But he loves us none the less. So please, come back. If you’re going to fly, don’t be Amelia Earhart. Come be a duck: let’s fly together. You belong with us. This post is day 15 of 31 Days of Belonging. WHEW! Almost half way! Thanks for all the comments, ‘likes’, emails, and words of encouragement. Thank you for thinking some of these posts worthy of sharing! It encourages this weary writer greatly. For a complete list of posts, please click here. I have often been at a loss as to how to counter their statements of non-church belief, but your aptly written illustration makes the point so well. Thanks Tracey, I actually only published it 30 minutes ago, so you are just a super speedy reader and I’m delighted that you commented 🙂 yes, I’m amazed at how many people there are on the fringes of the faith community. If this post helps at all to encourage people to step towards family in Christ, I will be thrilled. Ah, yes, I can relate to this article. 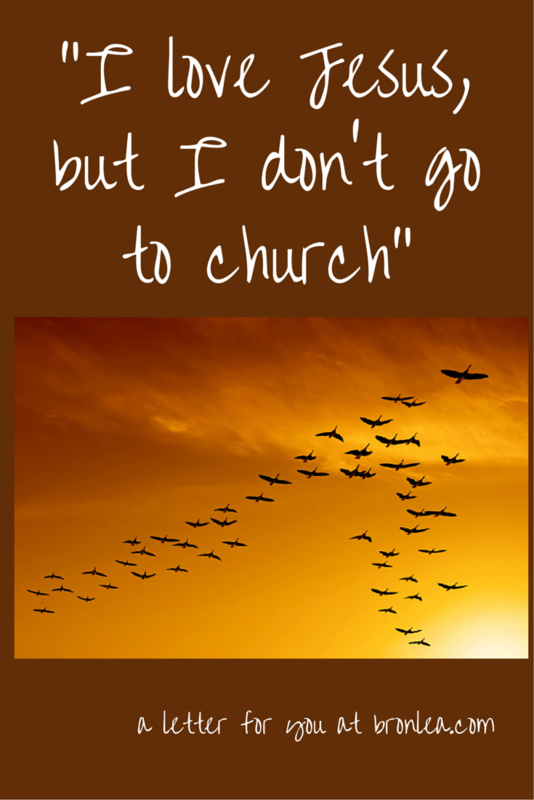 I foolishly tried “flying solo” with my faith, but I prefer being a duck!! I have learnt so much more from being part of a group, and have been astounded by the value of good Christian friends who have unknowingly helped me to mature. This is so good Bronwyn. Sometimes I think it’s easy to focus on what Jesus has saved us from (which is, of course, super amazing and important!) and ignore what He has saved us into. I’m going to be pondering and praising God for this tonight! saved from, saved into – love that wording. Do you know why one part of the ducks’ V-formation is longer than the other? Because it has more ducks in it. Gotta give Liz credit. She’s the one I heard that joke from. And, entering the PhD program means that there are things for us to learn and practice together. We are all His apprentices. We learn to worship and pray and serve and love together. I wonder whether flying solo was part of the learning process? No matter how many Bible Commentaries I read, and how much other Christian reading I did, I discovered that I needed MORE! Then a minister confirmed this, when he told me that I needed to be part of a Christian community. And, that helped to turn my life around! Hey Bron, I am one of those who are re-thinking and re-evaluating the concept of 21st century church. I started up at HT Gardens (you might remember). Found a home and got baptized, grew from crawling to walking in Christ, got married, started serving…and then i noticed that something is wrong…not with the people as such (you mentioned in your article already), but with the leadership of the religious organisation that calls itself “church”. The moment i grew out of my christian baby clothes and The Lord started to stir my mind and soul to seek a need for deeper understanding of Him, just as His Word urges us, i started noticing the massive brake pads that the religious organisation applies to anyone that dares to outgrow “them”…and “their” thinking. 1. The pastors/teachers speak a lot, but do very little to back up their preaching. Pastors spend countless hours preparing sermons, but very little time serving the people and engaging in the people’s life struggles. The trust relationship between pastor and flock is laughable…Hypocrisy at a highest level! 2. The preaching is often an expression of the preachers own interpretation of what the passage means to them and very little consideration is given to the need to challenge the congregation to seek wisdom from The Lord and to ask the Holy Spirit to reveal to the congregation (off course, it will always be a part of the congregation – whoever has ears to hear) the meaning of God’s Word and not rest until maturity is reached. 5. Pastors are (most of the time undisputed) top dogs in their congregations. What that means is that what the pastor says goes. The pastor feels that he is more accountable to the hierarchy (area bishop, etc…) than to his flock and especially to those who walk shoulder to shoulder with him..ooops, no one walks shoulder to shoulder in the reformed church. WE have a pyramid like structure. Pastor on top and everyone under the umbrella. Whatever the pastor is, the congregation is. Example: Al Noble is an amazing father like figure, so HT Gardens looks like a kindergarten! Well loved and looked after, but producing little baby fruits. Its an invert looking group. Very little love for the lost. Commonground Church is very social, very shallow, rich and rigid. Girlfriends and boyfriends type a thing. And no one is challenging them!!! You did, remember!!! There are off course more reasons why people avoid churches, but my point is that: We are on a sinking ship! We are at war! We are under attack and the “church” is acting like the musicians in the movie “Titanic”. as long as we keep playing the same boring music we are OK…we are acting as if everyone has a safe jacket on them and Jesus is on his way to pull us out of the water. People don’t want to hear that anymore…People desperately need Jesus, not some fake person who pretends to be him. People (the people who God has called) will flock back to church once the church wakes up to the desperate need for revival and starts acting more and talk about acting less. I will gladly join and give myself completely to a congregation that needs me and my spiritual gifts. “There are various ways in which “church” happens (or is manifested? ), and not just the most visible version of it that we typically imagine. Church is the body of Christ, it is community, it is collective worship, etc. and the phrase “going to” attached to “church” is sometimes a little confusing to me (and I do “go to” church, regularly). Just like the phrases “do church” and “do Christianity,” there seems to be a disconnect here, a fundamental difference between one’s understanding of belonging, place, and purpose. We ARE church, we ARE Christians. Being the church is not tethered to attendance down the street, though that’s one of the most organized and convenient manifestations of community for a lot of people. I’ve recently seen some interesting examples of church quite unhitched to the conventional building, steeple, pastor, program, once-a-week (plus small group, etc.) kind of model. I hear your call to belonging, to togetherness, to flying together (not eschewing community for the idea that we’re islands or solo-creatures, though to some extent we all have that aspect to us as well as the connected, interconnected, part-of-the-whole aspect). But I wonder if the call to “come back” is more compelling as a “come in, come forward,” or just “welcome” OR maybe a “go for it!” We never go “back” because we’re never the same we and where we go back to isn’t the same either. These are good things for us to think through and grapple with- we need to make sure we are part of the solution (moving towards an US mentality) and not part of the problem (THEY are doing church wrong) though. I So appreciate your comments. Thanks again! WholeHeartedly agree with you Nasco! I have to respectfully disagree with Nasco. No church is perfect. If it is…the moment we walk through the doors it ceases to be perfect. I’m not saying that we need to throw out all effort to live a life that pleases God (we’re all called to that). I am saying, though, that we need to stop shooting our wounded. There is an immense pressure to perform placed squarely on the shoulders of pastors. They are asked to do more and more with less and less. They are, many times, put at fault for why the church is in the condition it is when the ‘members’ are content to sit and ‘get fed’ while failing to fulfill the calling that God places on their lives. Please do not mis-understand this comment. There are pastors out there that are dictatorial and I don’t believe that it should be this way. God calls them to lead with humility, grace, and mercy. But He calls us to the same things. We are ALL part of the church. It does not rise and fall on the pastor. It rises and falls on everyone of us. The Bible is very clear about that (see 1 Corinthians 12). I see the need for revival in the church today. But it has to start with the one looking back at us from the mirror. Thanks, Jeff. I wholeheartedly agree. I do think Nasco and my friend raise a point though: what about when the “church” is Stifling or we are not able to serve and grow? I was deeply touched too by Anne Bogel’s piece (http://sarahbessey.com/can-feel-like-attend-church-tinies-guest-post-anne-bogel/), describing her pain at longing to be part of the “church”, but not being able to with their kids at this stage. My heart goes out to folk who long to belong but find it very painful or difficult to do so. I applaud Anne for still wanting to week community (and she does that in other ways, notably online and through individual friendships), but even she feels that they as a family are still missing out (and we who do belong to the institutional church need to think hard about how we can make re-entry easier or what we are doing or saying that keeps the wounded feeling shot instead of tended to). Hard questions. No easy answers. I guess I need to think some but pray even more about this. There are definitely churches that have a ‘us four and mo more’ mentality. I have been a part of them (and, sadly, have even served on staff at them). One thing — that I can see — marks these churches: they are stuck in the past and are not growing or vibrant. Much of the responsibility for that mentality does — and should — fall on the shoulders of the pastor. It is not what he was called to. The Bible is clear about that too (see Ephesians 410-12). In addition, much of that mentality trickles down from the top. It’s an incorrect view of how the church is structured. The best analogy I have heard is King Arthur and the Round Table. The king sat there and cast the vision…but there was not an air of arrogance in his position. He understood that he needed his knights and valued their contributions. It should be that way in the church. In this ‘structure’ those that are disconnected are actively sought out and ‘plugged in’. And the pastor and pastoral staff assumes the responsibility of ‘training the trainers’ so to speak. That’s what Jesus did. I too hurt for those that feel they do not belong or are disconnected. As part of the body of Christ we all have the responsibility to love and care for those who are struggling. It’s not something that the church is known for unfortunately. I pray that that will change. Thanks for the post and discussion. It’s definitely needed in the world we live in. And you’re right…there are no easy answers. King Arthur is such a great illustration. Would that we pressed more into the example of Jesus and his haverim. Further to last night’s comment 🙂 this morning our Mom’s bible study group was looking at 2 Thessalonians 2 (working our way through the 2 letters) and we were struck by the 3 times Paul addresses them as “brothers” within just that chapter (vv1, 13, 15). He exhorts them to “stand firm and hold fast to the teachings” (from the Word) – this is in response to their uncertainty and anxiety about the future (addressed earlier in the chapter). What struck us is that they are to stand firm as a community of believers, to hold on together…we so often read these verses and others like them as though they were written to us as individuals and, while they may be applied that way, they were addressed to communities of believers. I think in our consumer-driven society, many see church as an event/place where we go to get/achieve/benefit from something (and then are disappointed when our “needs” are not met), and instead of seeing church as a place where we go to serve the Lord and each other. I can;t remember where I read this, but someone once challenged us as believers to stop when we get to the door of the meeting place (church service or weekly meeting, whatever), and prayerfully ask the Lord who he wants us to minister to that day. That challenge has led to me making an effort to sit in a different place in order to speak to someone I don;t normally speak to, and to be open to going up to someone the Lord lays on my heart. It has helped me keep my focus on serving others when I go to meet with other believers. Oh, my, thank you for sharing this, Bronwyn. I would like to add we also go to.church to worship together. There is more power in a group. Jesus said whenever 3 or more are gathered in his name, he is present. Also we learn many nuggets of wisdom from the pastor/preacher’s sermon & personal anecdotes that they add in. Its great to be around others that share the love of God in common. The Bible also says many will come to God in tbe end saying Lord, Lord! And he will say he will say, he never knew you & you will be shut out of heaven. Do you know him as your heavenly father? To know him well we need to read & reread the Bible. Its our daily bread. We need daily food for our soul just as we need.food.for our bodies. I have found the closer I am connected, the more I yearn for him. I will make sure he knows me well as his faithful servant. Will you or will he be an acquaintance?